The quality of our reclaimed flooring and our flooring installations is second to none. It starts with our flooring experts selecting the highest quality reclaimed wood available. Then our craftsmen process and re-mill this wood at our state of the art manufacturing facility to turn it into the exceptional finished antique flooring. 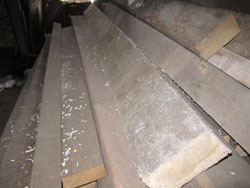 We create solid and engineered reclaimed flooring from this hand selected wood. Commitment to quality doesn’t end when we’re done manufacturing the wood flooring. Our expert flooring installation personnel then see that the installation process goes smoothly and overcome any issues as they install the floor. Working closely with the builder or contractors as needed to ensure the final product is exactly what you want. Kiln Dried – all of our reclaimed flooring wood is kiln dried to the correct moisture content before we begin the manufacturing process. This ensures a consistent product that adheres to our stringent quality control. Wood Grading System – we use a standard grading system that allows us to classify the wood into select and common grades. State-of-the-Art Machinery – the mills we use are high tech and allow us to mill the wood to exacting specifications. Our Wood Craftsmen – our purchasers, mill workers and our installers are well versed in our pursuit of quality products. Employees are trained in an ongoing effort to keep them up to date on latest milling techniques and installation methods.